A friend’s book needs your help! I’ve thoroughly enjoyed these stories and know you will too. Check them out! King Bewilliam needs YOU to nominate “The King’s Redress” for one of the 50 Books Worth Reading. Oh Joy! Time to Vote! There’s still about an hour and a half left (ok, a little less) to vote about the joy in this week’s stories for #WOW555. I would have said something earlier, but I wasn’t able to get to the computer while traveling…so…head on over to Write on Wendy, read the four stories, and vote for your favorite! The prompt for this week’s #WOW555 challenge is that we have to use the phrase “I’m outta here.” As I thought about that, and the end of the school year – today’s the last day with students for me – I couldn’t think of anything more fitting than a teacher finishing the year. Then I thought, what if she finished her career. (And yes, I used a female teacher instead of me as a male teacher.) What would it be like getting ready to retire. I’ve thought about it and decided to write about that dream. Mary Alice Everett had given her life to teaching. She looked at the clock and noted that she just had 15 minutes left. Today she was retiring. After thirty three years of caring for elementary students, studying in the summer, dealing with principals, and working with parents, today she could go home, kick her shoes off and plan for the trips she had always dreamed of. She smiled to herself as she thought about her upcoming cruise. When she looked at her second graders who were getting excited about summer break she had to grin more widely. Their mouths showed remnants of the frosting from the cupcakes they had been eating at the going away party. They didn’t realize what “retirement” meant, but they were enjoying the party. As time got closer for the final bell to ring, a few parents came by to pick students up early. But they stayed. These parents had once been her students, and they had come by not only to pick up their students, but also to say good bye to a teacher they had loved. Ms. Everett, as they still called her, got up to greet them and there were a few tears as they hugged. The bell rang and the kids, knowing something special was happening, lined up to hug Ms. Everett with sticky hands. She laughed a bit, knowing that it was the last time. More parents came by to say good bye and linger in her presence. Lydia Perez came by to bid her farewell on her way to check in at the office. Lydia had done her student teaching under Mary Alice. The strong recommendation Mary Alice had given Lydia allowed her to get the job that was open on the second grade team that year. The two of them had taught together for the last five years. Lydia was heading back from the school office when she saw Mary Alice. Lydia gasped and then ran to her as she lay on the floor outside her door. Lydia knelt down and felt for a pulse, but found none. She screamed for help as she pulled out her phone to dial 9-1-1. EMS got there quickly, but not quickly enough. They said it was a heart attack. Lydia knew differently though. She knew that Mary Alice Everett had given her life to teaching. Yep…I did go that way. That is, in a sense, a fear that I have that when I do retire, I won’t have that time I want to write, to photograph, or most importantly, to be with my wife. 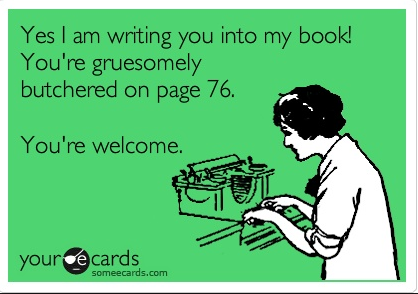 Someone noted that I tend to kill my characters a lot. I guess that’s just the way I roll.